[UPDATED, Jan. 23: The town meeting with Shaun Donovan has taken place and a video recording of the live-stream is viewable at "HUD Secretary Answers Your Questions."] For millions of Americans, owning one's own home is a fundamental part of the American Dream. It's a goal shared equally among all people, regardless of race or ethnic origin. But while the goal is equally shared, the path to reaching that goal, and even experiences once homeownership is achieved, can be radically different among races. In a report released this week, Zillow researched trends on minority access to housing, outlining the different experiences between races when seeking a mortgage, buying a home and during homeownership. The differences start at the beginning of the process, with minorities very underrepresented among successful mortgage applicants. And they extend all the way to homeownership. 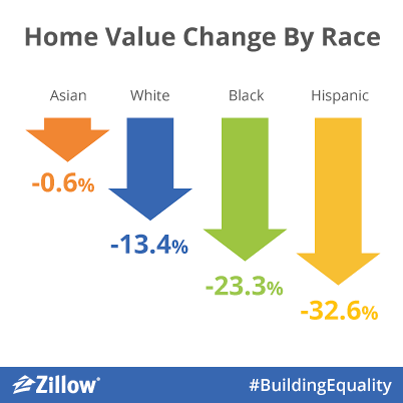 Once the dream is achieved, Zillow research found that neighborhoods that are predominantly black or Hispanic continue to struggle more than neighborhoods with heavy white or Asian populations (as illustrated in the chart above). With Martin Luther King Day just around the corner there isn't a more appropriate time to address these issues. Zillow is honored to have the opportunity to host Department of Housing and Urban Development Secretary Shaun Donovan on Jan. 22 for a town hall meeting via live stream from Zillow's headquarters in Seattle. The event, titled"Building Equality in Housing," will connect prospective homebuyers and others directly with HUD Secretary Donovan to bring us more information about what HUD and the Obama administration are doing to address these issues. Blacks and Hispanics are less likely to apply for a mortgage. While blacks make up 12.1 percent of the U.S. population, they filed 6 percent of all mortgage purchase applications in 2012. Hispanics make up 17.3 percent of the population, but filed 9.4 percent applications. In contrast, whites make up 63 percent of the U.S. population and filed 64.8 percent of purchase applications. Blacks and Hispanics are much more likely to apply for an FHA mortgage for a home purchase than a conventional loan -- more than half of black applicants (57.4 percent) and 60.3 percent of Hispanic applicants applied for an FHA loan. In contrast, less than one-third (30.1 percent) of white applicants apply for an FHA loan. Blacks and Hispanics are much more likely than whites to have their mortgage application denied. When applying for a conventional loan, black applicants are 2.4 times and Hispanic applicants are 1.98 times more likely than white applicants to be denied. Much of this difference is attributable to the different resources and qualifications of minority versus white applicants, and the research was not able to examine the extent to which discrimination was at play in lending decisions. After homeownership is achieved, neighborhoods with high minority populations have faced more overall depreciation since home values peaked. Since peak, home values fell 28.3 percent in neighborhoods with a high black population and 29.7 percent in neighborhoods with a high Hispanic population. By contrast, home values in neighborhoods with high white populations fell 15.8 percent, and in neighborhoods with high Asian populations fell 3.1 percent. Who: Department of Housing and Urban Development Secretary Shaun Donovan. Event moderated by Zillow Chief Economist, Stan Humphries. What: Donovan will discuss the current state of minority access to housing. He will take questions directly from mortgage applicants, home buyers and homeowners. Secretary Donovan will answer questions from mortgage applicants, homebuyers and homeowners via social media and a live audience so you have a chance to help shape the discussion. If you are interested in participating in the event please submit questions by tweeting to @Zillow using the hashtag #BuildingEquality. Submit your questions today, and don't forget to tune in Wednesday, Jan. 22 for the live event.